Montreal’s newly acquired Synth Palace. Despite being fully operational since November of last year, word has spread fast, dubbing Venuto’s vintage equipment rental resource, the city’s own “synth museum”. There is no hyperbole in this title. 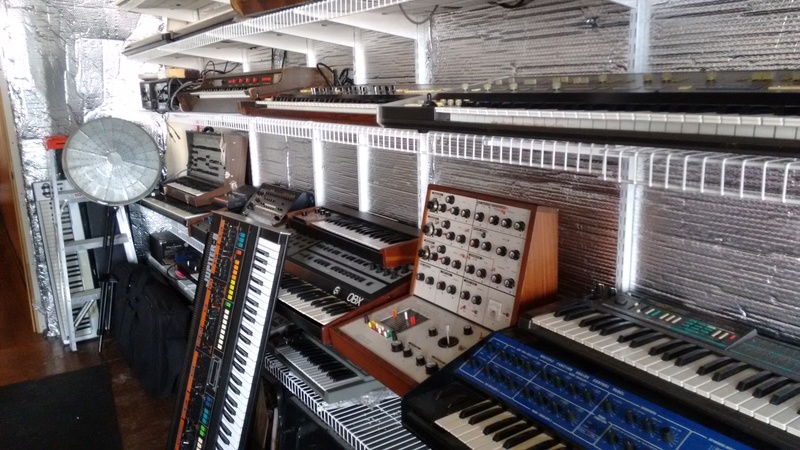 The synth palace boasts one of the largest collections of vintage and modern synthesizers, sequencers, and drum machines in the world. 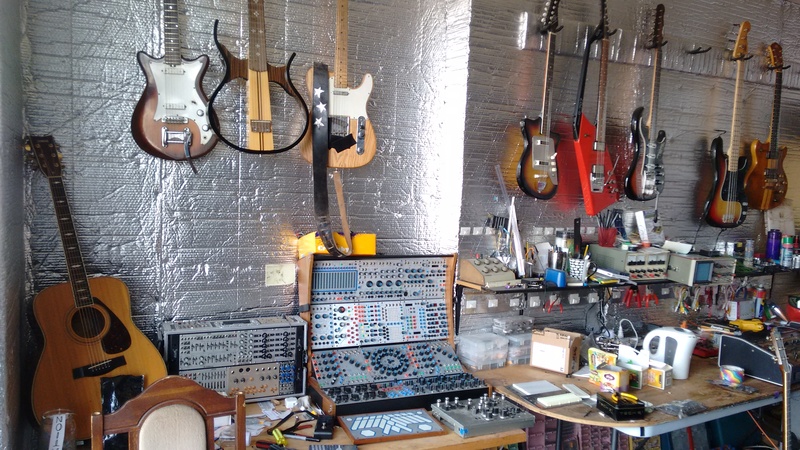 As a synth enthusiast it is hard for me to articulate the sense of wonder the aluminum insulated interior of the Synth palace inspires, as one is confronted with this collection of equipment. The entire history of electronic music, stacked upon dozens of shelves, towered over whilst the timeless minimalism of Oppenheimer Analysis’ “New Mexico” played over the speakers. I asked the Toronto native about everything from Venuto’s very first encounter with a synthesizer as a child, to the launch of his very own “Synth Palace”: the new cultural fixture in Montreal’s predominantly Francophone, burgeoning synth underground. DB: What was the earliest memory you have interacting with an analog synth? DB: Anymore synth interactions in your formative years? DB: How did you stumble across your first analog synthesizer? PV: “Analog synth became a primary feature of what I was doing by strange accident. My brother at the time was renting out some rehearsal space in Cherry Beach. Some hair metal band skipped out on their rent, and my brother emerged from their rehearsal space with this Korg Sigma, this synth from 1975! It was completely unlike any modern synth, amazing from a design perspective. There are two 360 degree joysticks on it, which is amazing because it riffs on the 70’s, early 80’s video arcade paradigm, you’re immediately tricked into thinking that your synth is a game. There’s this element of fun that is endemic with those very design decisions. The first joystick on the left would control pitch blends…whenever you moved the joystick up it would squelch the sound in one way, when you’d push down it would squash and freak out the sound another way, so you have all these gradients between all of that to really mangle your sound. The joystick to the right was entirely for the filter. DB: Did you use the Sigma for any creative endeavors? PV: “Around 20 years ago I was recording music in my bedroom, I’d just gotten a small record deal on this label called Grass records, operating under the name “Slurp”. I was coming up with songs, laying down drum machines, chord progressions, some fuzz guitar and vocals but the Sigma allowed me another melodic line that was not a lead guitar. I just fell in love with the strange quirks and electric inconsistencies that create the character of analog sounds. The ergonomic joystick configuration of the Sigma completely abetted the sounds that I would then include on the Slurp “Classic Rock” album. It became my signature sound to use analog synth for freaked out psychedelic indie music. If I wanted to replicate them with other synthesizers, analog or digital, it would be impossible. DB: When do you think the idea to open a rental space first emerged? PV: I was finishing this Slurp “Classic Rock” album, and wanted it to be fancy in a couple of aspects. So I thought to myself I have this Korg Sigma and that’s all over the album, but in a couple of parts I’d really love something that sounds like cellos and piano. At the time that was totally out of range, it was like eating at a 5 star restaurant. 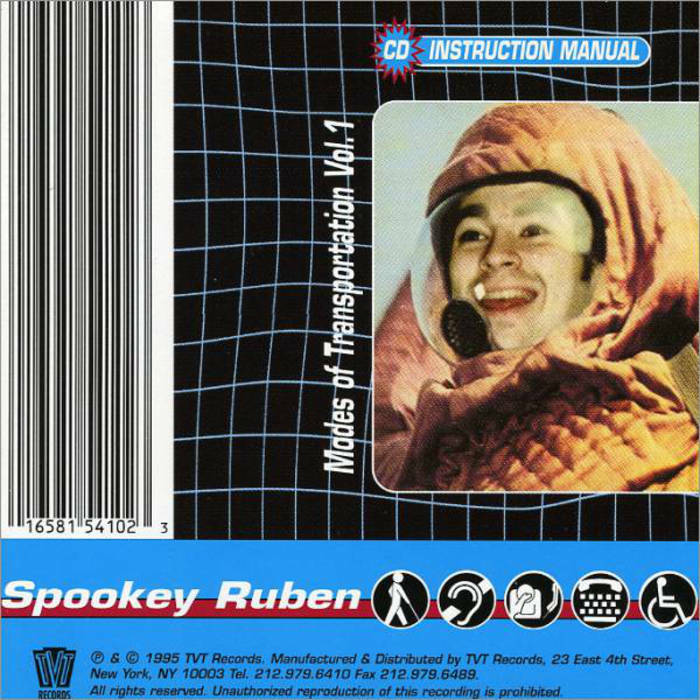 My friend Spookey Ruben had just been making his record “Modes of Transportation vol.1”. He had a considerably larger record deal with TVT/Interscope and he had an Ensoniq ASR10 60 bit sampling keyboard. I thought “Oh my god that could do anything!” I asked if I could borrow it for the month, he let me. That was the third thing [following the science center encounter, and inheriting the Korg Sigma] that consolidated subconsciously the idea to open up the synth palace. I knew firsthand how much a big deal it is for someone who is working on their music to be able to have the practical means to execute that into reality. 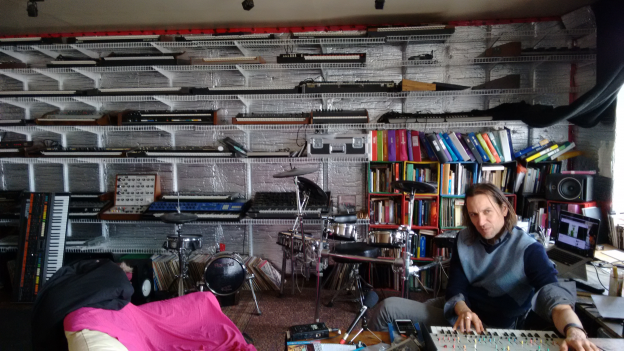 Spookey’s generosity made that divine interface happen and incepted this concept of opening this space where people would be able to get their hands on these synthesizers and analog equipment. DB: What is the Synth Palace’s philosophy? damage the equipment and it’ll be a big nightmare”. I have a general belief in humanity. If people in the situation know what’s up, they will understand that just like a library if you’re careful with the stuff and bring it back, it’s there for the community. Particularly in a city like Montreal, people are more community conscious than in larger cities. I encounter a certain respect here that goes beyond just being polite. DB: How was that transition to becoming a collector? PV: The actual collecting, you never set out to do that consciously. It became conscious around 5 years ago, when I was operating my event space in Kensington Market in Toronto called “rainbow palace” and I was doing pretty good business. That was creating the flow to make that final leap, which was to try and get my hands on the pricier synths. The classic classics like the Jupiter 8, the PPG 2.2, the ARP 2600, the Buchla…I thought to myself these things are never going out of style, there will always be a demand to come face to face with the genuine article. DB: Do you see a resurgence, this analog synth revival? PV: I think that’s happening right now with Korg and Roland reissuing the Odyssey and making affordable versions, or even the modules, the Jupiter 8…this is proof positive to the fact that love for these sounds is never going to go away. What I have to offer is what a lot of people forget. More than half the joy is the actual user interface themselves. Like I was saying before “Let’s throw two 360 degree joysticks and see what people do with that!” These classic analog synths each have different user interfaces, each time you will have a different user experience, this informs the music that will be generated. We are haptic physical beings, computers create the illusion that we only exist from the neck up. PV: You can get all those sounds off your computer with VST (Virtual studio technology) and I do celebrate that. For example John Maus’ “We must become the pitiless censors of ourselves” that was all done with VSTs of classic synths and I love that album to death, it’s a masterpiece. However when he’s asked if he would you like to get his hands on the real thing, of course he would! But to facilitate the fact that he’s a touring musician this allows him to continue to make music in hotel rooms or wherever he happens to be, couldn’t support that more. If you’re a good musician you’ll work with whatever you’ve got, but 99/100 would want to get their hands on the actual thing. The sound is better and you’re working within another haptic universe where you are not tethered by a mouse. It’s exciting to see what people are going to do with a synthesizer from the 80s but coming from a 21st century mindset, it never ceases to amaze me what new tricks or devices these machines will be put to. DB: When did you become involved in Montreal’s minimal synth music community? PV: While operating the “Rainbow palace” I was able to throw an event with a couple of friends Emad Dabiri and Jubal Brown, called “Shitfun”. The first one we did together was Martial Canterel doing an after-party. I was thrilled as a huge Xeno and Oaklander fan. That party was a catalyst for a more focused idea, which was to expose minimal synth music from Montreal to Toronto audiences. I saw Marie Davidson play at Pierre Guirineau’s space while visiting. I was just transfixed, this tremendously charismatic seemed to have a nervous breakdown on stage. It was the first time outside of maybe hearing Brigitte Fontaine that I heard something so perplexing, it was drawing you closer by creating a sense of distance. 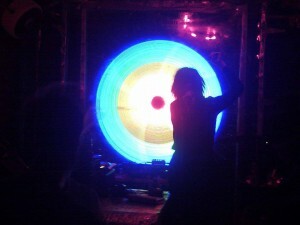 That same night I was looking to book her for “Cold Rainbow” one of the events I did. Marie Davidson and Essaie Pas did a double bill one night. Amazing dark luminary figures like Low Factor played as well. 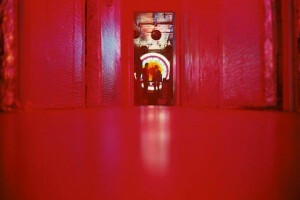 DB: How did the switch from rainbow to synth palace here in Montreal occur? PV: There were inherent problems in running an after-hours space, namely cops come by checking if there are illegal sales, even if there aren’t it just kills the buzz. I found there was no good way of circumventing that. I thought to myself I should really find something to segue into, and that’s whenever I was putting the final touches to the collection. The memory from the science center converged with this freak occurrence of getting this metal band’s analog synth, and I thought it might be a good idea to transfer to this synth palace idea. DB: What is it about Montreal that fosters this return to analog synth? PV: It was an interesting position for me as an Anglophone at the Marie Davidson show, it wasn’t important so much the content, but the delivery, the enunciation, the raw emotion attached to it. Coldwave, minimal synth is endemically in large parts a French phenomenon. The music came primarily from France, Belgium, it’s only fitting that Montreal is a prime location for its renaissance. It’s got Police des Moeurs, Essaie Pas, Low Factor, Litige, Xarah Dion, Violence and many others. When I go to Toronto, it’s not like I can go to a “casa”, or a “la vitrola” and see a coldwave act any given week. We’re really spoiled for choice here. It’s particularly interesting in a place like Quebec where there’s this cultural isolation, but all these things are eviscerated when you are watching or listening to this music, you can immediately lose track of where you are and when you are. DB: How do you describe this retro-futuristic impulse to re-incorporate the original analog sound into contemporary music? PV: Both time frames are having a discourse or dialogue, it may seem like we (the present) have the dominant position if you can talk about it in such terms, but it’s actually the other way around in this genre. I find it interesting that we have total command over the musical spectrum, and we can come up with anything that can be thought of, yet there’s something in us that we find tremendously aesthetically pleasing that we return to a perspective that was generated in the early 80’s. It’s that moment of time that persists and still has aesthetic inertia and power, 30 years later. This entry was posted in CKUT programming and tagged arp, buchla, essaie pas, litige, low factor, marie davidson, minimal synth, modular, Montreal, peter venuto, rainbow palace, spookey ruben, synth palace, violence, Xarah Dion on March 31, 2016 by Danilo Bulatovic.